Fremont, CA – December 23, 2011 – Jason McDonald, a leading SEO / Social Media consultant in the San Francisco Bay Area, is proud to announce renewed plans for 2012, focusing on helping San Francisco Bay Area companies to dominate Google and Bing through both free SEO and paid AdWords advertising. 2011 was a very successful year for Dr. McDonald, with numerous teaching engagements, speaking efforts, and consulting for companies as diverse as large San Francisco hospital chains to New York City watch repair shops. "I love to help people," explained Dr. McDonald. "And I get a buzz out of getting companies to the top of Google searches via SEO as well as consulting with them to explain the in’s and out’s of successful AdWords advertising. Both SEO and AdWords should work together. Living in the San Francisco Bay Area allows me to work hand-in-hand with a broad spectrum of companies – from insurance, medical, and real estate in San Francisco to high technology companies in San Jose and Silicon Valley. I plan to renew my focus in 2012 as an expert SEO / AdWords consultant right here in my back yard: the San Francisco Bay Area." No matter how crucial it may be for the success of your product, marketing seldom receives the full funding that marketing managers think is necessary. Hands-on consulting by Dr. McDonald helps to teach the secrets of marketing without money — think of it as "creating buzz without bucks." SEO – Search Engine Optimization – is all about getting to the top of Google or Bing for free, using free tools. AdWords, in contrast, is about paid advertising. By consulting with companies in the San Francisco Bay Area, Dr. McDonald has a proven track record of helping companies create effective SEO, AdWords, and indeed Internet Marketing strategies. He is a proven expert consultant in these areas. Dr. Jason McDonald is a recognized SEO / Social Media Marketing consultant and corporate speaker in search engine optimization, Internet marketing, and search marketing based in the San Francisco Bay Area / Silicon Valley. Dr. McDonald received his Ph.D. from the University of California in 1992, and has worked at many hi-tech start up’s in the San Francisco Bay Area. In addition, Dr. McDonald is Senior Editor at eg3.com, a web portal and email service covering hi-tech embedded systems on the Internet, founded in 1994. Recently, Dr. McDonald has teaches marketing, market research and Internet marketing at Bay Area institutions such as AcademyX, DeVry University, and Stanford University’s Continuing Studies. Dr. McDonald can be found on the Internet at https://www.jasonmcdonald.org, a website focused on search engine marketing, SEO, and other Internet marketing issues with in-depth free information on SEO, Page Tags, Google Analytics, Metrics, Link building, Free SEO Tools and more. He can also be contacted by telephone at +1-510-894-6169 or email, jasonmcdonald.blog@gmail.com. AdWords is Google’s pay-per-click advertising product. AdWords ain’t easy – it’s easy to spend too much money on bad keywords, mix up the Google vs. the Display Network, or generally just get lost in the hard-to-use Google AdWords user interface. Even worse, you can spend a ton of money on AdWords but neglect to get the free stuff of SEO or Social Media Marketing. Howie Jacobson, Joel McDonald, and Kristie McDonald have written the best book on AdWords – new for 2011! Here’s my review. Howie Jacobson and his co-authors Joel and Kristie McDonald of Vitruvian Way (http://www.vitruvianway.com/) have updated Google AdWords for Dummies and made it truly the best book out there on a difficult subject: Google AdWords advertising. If you are interested in AdWords, this is a "must have" book, and it certainly earns its place on my shelf as one of the top ten books of 2011 on Internet Marketing, especially AdWords. SEO – Search Engine Optimization, getting to the top of Google – for free. AdWords – paid, pay-per-click advertising on Google and/or the Display Network of blogs, portals, gmail, etc. Social Media Marketing – free efforts on Facebook, LinkedIn, Twitter, Google+ and the like. A good – no, a great- marketing plan doesn’t look at any one subject in isolation, but rather looks at the whole picture and simultaneously attempts to get your company buzz and visibility across each pillar. In my experience, the most powerful bang-for-buck is on SEO. SEO is free (in terms of out of pocket costs), and SEO gets you more clicks and even better conversions than either AdWords or Social Media Marketing. I have had many, many clients and worked with thousands of students and universally their experience is the SEO outperforms AdWords by a long, long way. The implication here is to do SEO first, or at least make it a priority. 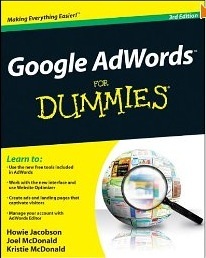 Howie Jacobson’s AdWords for Dummies, like most books focuses mainly just on AdWords. To his credit, he does mention SEO and he is clearly cynical about Google’s interest in promoting paid advertising over free SEO. Even more so, he fills the book with numerous gems of wisdom, hidden insights, illumination of gottchas, and other ideas that make this book infinitely more valuable than a one-on-one with some of the knuckleheads at Google AdWords who answer the phone and emails at the help desk. Just remember to position your AdWords inside of a broader Internet Marketing, and you will do fine. But if you do AdWords by itself, even if you read AdWords for Dummies, – you will have done yourself a terrible and expensive disservice. AdWords should always be done in conjunction with SEO as part of a comprehensive Internet marketing strategy! Never do AdWords alone! Conversions – explanations, tips, and advocacy about how important conversions (i.e., getting a sale, getting a registration, getting an email sign up) are to successful AdWords advertising. Google vs. the Display Network – a clear discussion of why new advertisers should NOT advertise on the Display Network, and how the Display Network can be a terrible waste of money despite how Google leads you astray in the AdWords interface (!). Remarketing – novel insights on how you can ‘remarket’ to your existing web visitors, a tracking technique along with Google AdWords that gets your message repeated to potential customers over and over and over and over again. The book is a companion to AdWords, written by someone who loves the product but doesn’t love it blindly. Throughout, Howie explains what you should do, and what you shouldn’t. And he points out clumsy misleading stuff in the interface such as the Display vs. Google Networks, and how conversion optimizer ain’t what it’s cut out to be (by Google). For that, he earns my immense respect – in a field full of Google wannabees and Google apologists. Match Types – Howie points out most of the match types, but doesn’t emphasize enough how broad match (no quotes) can get you into serious serious trouble. He also doesn’t explain with enough emphasis how one should circle back and review what matches, exactly, Google is placing your ads for. In my experience, broad match causes lots of expensive headaches. So be sure you understand AdWords keyword match types! Geotargeting – location, or geo, targeting is one of the most important features of AdWords. Howie doesn’t clearly explain how you can mesh a successful SEO strategy on long tail keywords with an AdWords strategy for short tail keywords. In today’s local search economy, it is very common for a company to show up on its own community / local search and then ad an AdWords campaign ‘around’ the ‘donut hole’. This strategy is missed in the book. All in all, however, Howie Jacobson, Joel McDonald, and Kristie McDonald have clearly written the best book on AdWords by far – so I recommend you go out and buy Google AdWords for Dummies today!